Workers age 55 and older are more likely to die on the job than those in other age groups because of a declining sense of balance, muscles and bone weaknesses, chronic medical conditions, reduced response time, and vision and hearing impairments. 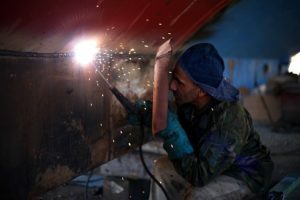 While the rate of workplace deaths over the last couple of decades has continued to decline, older individuals are dying on the job at a higher rate than workers in general. The number of workplace deaths among all workers decreased from 5,480 in 2005 to 4,836 in 2015, representing a 22 percent drop. During that time period, the number of fatal workplace accidents that involved workers 55 and older increased from 1,562 to 1,681. This represents about 35 percent of the overall fatal workplace accidents. Physical changes associated with old age could raise the risk of accidents and potentially turn a simple injury into a more severe or fatal one. Gerontologists highlight that reasons for this death toll among older workers include a waning sense of balance, weakened muscles and bones, chronic medical conditions, reduced response time, and gradually worsening vision and hearing impairment. In an Associated Press analysis, 44% of older workers said that it was more difficult to carry out physical tasks than when they were younger. With older workers struggling to keep up in fast-paced work environments, safety is often jeopardized. While many workplace fatalities can be attributed to natural causes, employers are not paying enough attention to occupational safety and training. The analysis shows that the most common types of accidents that lead to deaths are fall-related, followed closely by contact with objects and equipment, transportation accidents, and fires and explosions. As baby boomers reject the traditional retirement age of 65 and the workforce continues to age, there are worries that these hugely disproportionate fatalities among older workers will persistently be on the rise. With the number of workplace deaths among older workers increasing at an alarming rate, the National Center for Productive Aging and Work continues to push for changes in the workplace, like brighter lighting and other accommodations that may make it safer for the aging workforce.